Soon in his life, attracted by mangas and fascinated by horror and terror movies, he began drawing. Sadly, despite the will, he didn’t get the possibility to study this fiel but took his revenge by beginning photo montage in his adulthood. Commited, without course or degree, he trained by himself to create as realistic as possible portraits. Being unemployed since the loss of his cyber-cafe and do not support the inactivity, he devoted much time working to improve and this led in 2012 to the creation of this web site in order to share his peculiar world. At first this site was mainly intended for people who know the artist personally. However, based on positive feedback from relatives but also of curious strangers fell by chance into this den of horror, the author decided to give him more visibility. He was inspired by artists of the same universe, Rob Zombie, John Carpenter, Wes Craven, Sam Raimi, George A. Romero, or Stephen King. In his portfolio you will find essentially portraits in the field of horror. 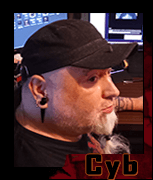 In some sorts, via this site, Cyb gives you to see a personal vision of a very dark world.